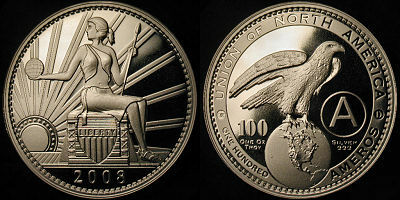 The conspiracy camp all but concluded that the Amero would be issued by 2010 as a product of the North American Monetary Union, which some argued was to be part of NAFTA. It made for a great prediction; in Canada, they were calling it just USA and Canada. The idea never gained fundamental support politically and fell apart after 2007. Today, with the demise of the euro so obvious, there seems to be no real interest in attempting this idea, which was born out of competition with Europe. Gee, if they have one, we must need one. Our greatest real conspiracy is the jockeying of the IMF to have SDRs (unit of account; Special Drawing Right) replace the dollar as the international reserve currency. This is in part to secure their political role in competition with China. They fear China will set up competition to the IMF and they will fade into the sunset. So exactly as Brussels needs the euro to keep their jobs, the IMF is looking at securing their future with the SDR. The euro has proven that you cannot create a currency and force it down the throats of the people. You cannot force the economy to do anything that is against the free markets. You can suppress the free markets, as Communism did, but in the end, the Invisible Hand will always win. This is in part our Capital Flow Analysis, which we developed and studied, noting how it was even was at work in ancient Rome. The euro killed the Amero. It is the IMF we need to be concerned about.